The first time the Backup Service starts, it scans for existing backups, including backups from versions of OpsCenter prior to 5.1 (the release when the Backup Service made its debut), and populates the backup_reports table. If there is no backup activity, or OpsCenter was recently upgraded, the Activity page indicates there is not any backup activity available at this time. If the OpsCenter instance has no prior version, create a backup to get started. If OpsCenter was just upgraded, click the link to synchronize activity. To manually synchronize the backup_reports table, click the inline sync activity link or Actions > Synchronize Data. The Synchronize Backup History Data dialog appears. 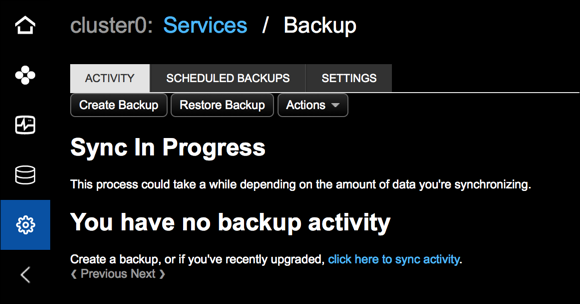 Select the locations whose history you want to synchronize and click Sync Backup Data.